Hi, I'm Lynndi (not me in the photo, I'm taking the picture). I sincerely appreciate the effort by so many who have tried to get in touch with me before this initial page. Thank you, all! 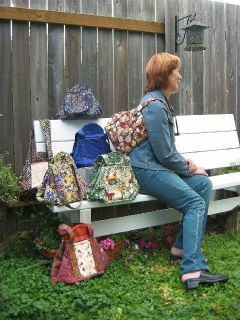 I designed the Diva Essential Designer Bag© and have published the pattern. The pattern includes photos and comprehensive written instructions. This bag is the "perfect" purse for anyone from 12 to 112 years old. It has 3 outside pockets, 6 inside pockets and a secret pocket as well. One can carry the bare essentials, fill the bag for travel or even use as a diaper bag. And, for those times when you need your hands free, it can be worn as a backpack. I sell retail to the public and wholesale to shops (registered business number required). Distributors welcome. Until I get an online store, please contact me for price, shipping charges and payment method. Copyright © 2005 Thumbuddy Special™. All rights reserved.